Does diffusing essential oils kill germs? Answer: My experiments show that the vapor from a diffuser with Young Living Thieves oil or do Terra On Guard oil does inhibit bacterial growth, but it won't disinfect a whole room. 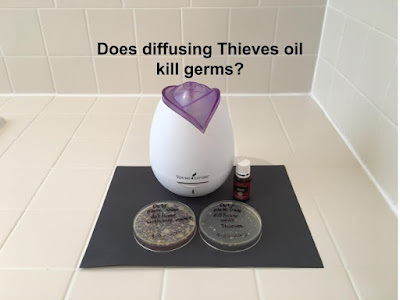 1 Does diffusing thieves oil kill germs? 2 Does diffusing On Guard kill germs? 3 Will diffusing Thieves oil disinfect a room? I have already done many experiments which suggest that essential oils like Thieves and On Guard kill germs in on a hard surface. You can see those results on this page. However, many people wanted to know if diffusing Thieves oil (and other oils) actually kills any germs? Diffusing Thieves oil certainly makes a room smell good, but is there any germ-killing? I decided to test it. If you would like to know more about me, please read my About the Scientist page. Disclaimer: I am not an essential oil expert or a medical doctor. I don't normally use essential oils. I don't even know if using these oils is safe for you and your children. So, just because I'm doing these experiments where I'm diffusing oils, doesn't mean it is safe for you. Some people say that Thieves oil is not safe for children. Just because something is "natural" or "organic" doesn't mean it is safe. Does diffusing thieves oil kill germs? I designed an experiment to determine if the vapor coming out of a diffuser with thieves oil kills bacteria on an agar plate. I purchased a new bottle of Thieves oil from http://www.striveforhealthy.com/. Then, I borrowed a Young Living diffuser from a friend. I also purchased these ready-made agar plates. Next, I borrowed some of my children's Megablocks and built an apparatus to hold the agar plate upside down over the diffuser. The plate is 9.5 inches above the opening of the diffuser. Then I made some really germy agar plates. In case you don't know, agar is a yellow, jello-like substance that bacteria and fungus love to grow on. Viruses do not grow on agar plates. New agar plates are all clean and shiny with no germs growing. To get the plates covered in bacteria, I swabbed dirty things around the house. I swabbed the kitchen floor and rubbed the swab all around an agar plate. With a new swab, I swabbed the kitchen sink and rubbed that swab all around the same agar plate. With a clean swab, I swabbed the bottom of a dirty shoe and rubbed that swab on the same agar plate. Lastly, with a clean swab, I swabbed the dog's mouth and collected some of his drool and rubbed that swab all over the same agar plate. Luke was not happy about that, but I gave him a piece of cheese afterwards. I scribbled and rubbed the swabs all around the plates so they should have had bacteria all over them. Initially, I made 2 nearly identical dirty agar plates which both had been rubbed with germs from the floor, sink, shoe, and dog. One would be the control plate that would NOT go over the diffuser. It should grow a ton of bacteria after 24 hours in the incubator. The second plate would go over the diffuser with Thieves oil. I wondered if it would grow the same amount of bacteria or if the Thieves vapor would kill some of the bacteria. I put 12 drops of Young Living Thieves oil in the diffuser with 1/2 cup distilled water. The Young Living website says to use 8-12 drops of oil in the diffuser so I thought I'd try 12. I got those directions from this page of the Young Living website. The diffuser ran for 3 hours with the plate over it. You can see that the diffuser vapor really hit the agar plate. If you don't know much about diffusers, the vapor is cold. It is not hot like I originally thought it would be. As soon as the first thieves plate was done, I made another dirty agar plate and repeated the experiment. I swabbed the floor, dog, sink, and shoe and rubbed the swabs all over an agar plate. Then I put 1/2 cup of distilled water and 12 drops of Thieves into the diffuser and put the plate on top of my apparatus. It ran for 3 hours. I needed to determine if just the water vapor blasting on the plate was enough to kill germs so I did a water-only control. As soon as the Thieves plate was done, I cleaned the oil out the diffuser. I used a tiny drop of dawn dish soap, rinsed it out multiple times, and wiped it dry with paper towel. Then I ran the diffuser with just distilled water for an hour. Then I put clean distilled water in and started the water-only control. I made another dirty agar plate just like the first three. I swabbed the floor, the dog's mouth, the sink, and the dirty shoe and rubbed it all over another agar plate. I put that plate over the diffuser for 3 hours with just distilled water. This plate was done about 6 hours after the first 2 plates so might have a little less bacteria on it when comparing it in a picture to the others because it had less time to grow in the incubator. After the water-only control was done, I put all 4 plates in my warm incubator (about 90 degrees F) for 24 hours. In case you are new to looking at agar plates, the whitish or yellowish dots you see are colonies (or piles) of millions of bacteria. Not every kind of bacteria can grow on these agar plates and viruses do not grow on these plates. So, just because a plate looks clean, doesn't mean that no germs whatsoever were present. Fungus can grow on these plates, so we are looking at bacteria and fungus. I think the results are amazing! The dirty control plate is covered with bacteria as expected. The plate that was over the diffuser with just water is covered with bacteria just like the control plate. The 2 plates that were over the diffuser with thieves oil have MUCH LESS bacteria! I was so excited that I repeated the experiment again the next day. Does diffusing On Guard kill germs? I repeated the same experiment that I did with Thieves oil to test do Terra's On Guard. I got 2 agar plates dirty with germs from the floor, sink, shoe, and dog drool. I placed one plate upside down on my MegaBlock apparatus. I used 1/2 cup distilled water and put 12 drops of On Guard oil in the diffuser. The diffuser ran for 3 hours. I put the other plate 25 feet away from the diffuser, right side up, with the lid off during the diffusing time. Then both plates went in my warm incubator for 24 hours. I did not repeat the water-only controls for this experiment because it isn't necessary. I've already established that just diffusing water doesn't harm the bacteria. It appears that diffusing the On Guard oil also inhibits bacterial growth, too. Again, I can't be certain if the oil (or any product that I test) is actually killing the germs or just stopping them from growing. I think and hope they are killing the germs. Will diffusing Thieves oil disinfect a room? Many people have asked me to test and see if the vapor from a diffuser with thieves oil will kill germs further around a room. To test this, I decided to start in the smallest room in my house, the bathroom. The bathroom is an 11 feet by 5 feet rectangle. I got 3 agar plates really dirty by swabbing the floor, the sink, the bottom of a shoe, and the dog's mouth. I tried to get them as equally germy as possible. I put one agar plate next to the diffuser on the bathroom countertop. I put another plate 5 feet away on the edge of the bathtub. The plates did not have their lids on. I put a third plate out in the hall and closed the bathroom door. I put distilled water and 12 drops of thieves oil in the diffuser. The diffuser ran with the bathroom door closed for 3 hours. I did these experiments when the kids were at school so no one ever opened the bathroom door during an experiment. Afterwards, I put all 3 plates in my warm incubator for 24-48 hours. I did this experiment 6 times and got varying results. The first results were perfect, and I was so excited! And then that never happened again. I was so bummed. Sometimes it looked like there might be a little less bacteria on the plate right next to the diffuser. Other times it looked like there was no difference. I don't know why it was so inconsistent. I did notice that it seems like most of the oil stays in the diffuser stuck to the sides. The house smelled strongly of Thieves so I know some was getting into the air. Lots of vapor was coming out of the diffuser so it seemed to be working well. I just bet if more of the oil actually made it to the air then I could use much less oil and more germs would be killed. Is there a better type of diffuser that I should use? Someone please let me know. So, we can conclude that the vapor from a diffuser with Thieves or On Guard oil does inhibit bacterial growth. Will it disinfect an entire room? Not likely. I still recommend using a strong germ-killing cleaning product if anyone in the house comes down with a stomach bug, such as the Clorox Hydrogen Peroxide Wipes and the Clorox Hydrogen Peroxide Spray. Will breathing the Thieves or On Guard vapor provide health benefits? Maybe. I have no idea. Some people say that certain essential oils like thieves are not safe to use around children. My children were all fine during these tests. If you are interested in using essential oils or getting a diffuser and don't already have a friend that sells them, contact http://www.striveforhealthy.com/. That is where I got mine. If you want to see more of my essential oil experiments, check out these pages. Do essential oils like thieves really kill germs? What else do you want me to test? I am going to test using only 6 drops of oil in the diffuser as soon as I get more agar plates and more Thieves oil. I've run out. However, I really need to earn some money from this website to buy all of these oils, agar plates, and supplies. I also want to by some of the Purification Blend essential oil. If you want to support my work, please use my amazon affiliate links when you shop on amazon. If you use one of my links to click to amazon and buy something, I get a small percentage of the sale no matter what you buy. You don't have to buy the product that the link was for. That is where I get the money for these experiments. So, please use one of my links, here is a link, if you need to shop on amazon. If you don't want to bother using amazon links, you are welcome to send me a small donation through paypal. If you share pages of my website, that will also help me get traffic and earn the money for more experiments. Also, please post on my facebook page and let me know what other experiments I should do. If you would like to be informed when new results are posted, please like my facebook page. I always post on there when new results are up. If you really want to brighten my day, please buy one of my daughter's books . They are excellent! If you don't have a little girl to give them to, buy a copy for your local elementary school library or children's hospital. Thank you! Annie, thank you for your awesome research here! Over at Aroma Outfitters, we’re very involved with essential oils on a daily basis. We mainly focus on essential oil accessories, like our (really gorgeous!) wooden storage boxes, but our family uses essential oils on a regular basis for everything ranging from homemade cleaning products to soaps and shampoos… basically, if it’s possible to replace a store bought product with an organic alternative, we’ve probably tried it. Your research was so fascinating because we’ve found that using DIY cleaning recipes that involve essential oils have been very successful for us. However, as much as we love essential oils, we agree that in order to do a total disinfection of a room something stronger is probably going to be necessary. Having said that… we very rarely get stomach bugs or colds. The difference between our pre-essential-oil days and now is definitely noticeable. You’re the scientist here, but we suspect this is thanks to making the effort to enjoy cleaner living in general while using essential oils to improve our overall well being. Certain essential oils are proven immune boosters. We sleep better thanks to essential oils, and as you no doubt know, sleep is an integral component to good health. We soothe minor cuts and scrapes with essential oils. After switching to as many all natural, essential oil based products as possible, we’re quite sure that our exposure to potentially harmful (and immune damaging?) chemicals has been reduced. The best thing about making alternative household products yourself with essential oils is that you at least know exactly what’s in them. If you look at the ingredient list for even a bottle of simple shampoo, there might be dozens of ingredients with names that you could hardly pronounce—whereas with DIY products, there might be five ingredients, all of which you know are safe for your body, your children, your pets, etc. Research like yours is important so that people have a clear understanding of what essential oils can and cannot do. We sometimes see websites promoting essential oils as magical cure-alls, which they aren’t. They can do some really amazing things though. Just like with anything you choose to inhale, put on your skin, ingest, and so on, nothing should be viewed in black and white terms. What we’d love to see more of are people who have a realistic understanding of essential oils and their benefits, rather than those who think they’re somehow magical or those who dismiss them completely. Work like yours promotes a healthy, balanced understanding of these awesome oils from nature, and we thank you for it!